Citation: C N Trueman "The Dambusters"
The Dambusters have been immortalised in World War Two folklore as a result of their attack on the dams of the Ruhr. As part of the Allies bombing campaign against Germany during the war, the Dambusters wa an elite Lancaster bomber unit and the raid was led by Wing Commander Guy Gibson VC. How much impact the Dambusters raid had is still debated but what cannot be denied is the bravery of the men involved in the raid and the unique contribution made by Dr.Barnes Wallis who developed the unique bouncing bomb that was used on the raid. If the raid did not have a long term impact, it did have enormous propaganda value for the Allies. Barnes Wallis was an employee of the Vickers Aircraft Company. In March 1941, he completed a piece of work entitled “A note on the method of attacking the Axis powers.” Wallis had envisaged the Allies using a huge bomb against the Germans – ten tons in weight so that any building/object was vulnerable to an aerial attack even if it was built underground. This fifty-page piece of work stated that the Allies had to develop a new form of bombing if massive concrete structures were to be destroyed. He wanted much larger bombs built so that the area surrounding where the bombs were dropped would be so massively shaken as to create enough jarring pressure to shake a target to pieces. Therefore, pinpoint precision bombing would no longer be necessary as physics would take over once a bomb had exploded. Wallis proved that a 10 ton bomb dropped at 40,000 feet would go 135 feet into a normal surface and would create no crater as all energy would be directed into an earthquake effect with potentially devastating consequences. However, no one was particularly interested in what Wallis had written and many felt that his ideas were just ‘pie-in-the-sky’. No one had ever built a bomb that was 10 tons; no bomber had ever been built that could carry such a bomb and no plane flying then could fly at 40,000 feet. Some saw Wallis as an eccentric. However, one part of his paper did attract attention. Wallis believed that Germany’s industrial heart could be destroyed – literally drowned – if the huge dams in the Ruhr were destroyed unleashing vast quantities of water into the Ruhr industrial sector. An ‘Air Attack on Dams Committee’ was formed in 1941 under the chairmanship Dr. Pye. The committee decided that the primary target should be the Möhne Dam which enclosed the Möhne and Hedve rivers. The dam was 130 feet high and 112 feet thick at its base. Even the top was 25 feet thick making it a formidable target to destroy. However, Wallis was not easily put off. Wallis was keen on the idea of getting an explosive charge as near to the wall of the dam as was possible. Wallis believed that if this could be done on the lakeside of the dam, the vast pressure applied to that side of the damaged wall would be enough to destroy the dam itself. A torpedo type bomb was out of the question as the Germans had already thought of that as a way of attacking the dam. Anti-torpedo nets protected the dam. Wallis came up with an idea he called “childishly simple”. He believed that you could use a bouncing bomb that would clear the protective nets, that would smash into the dam wall, stay intact and then sink to a depth of 30 feet before exploding using a hydrostatic fuse (similar to the ones found in depth charges). To ensure that the bomb went down the dam wall, Wallis planned for the bomb to spin forwards after it had hit the wall – despite the fact that it would be dropped by a bomber spinning backwards. Wallis received permission to develop the bomb – code-named ‘Upkeep’. The bomb was 50 inches in diameter, 60 inches long and weighed 9250 lbs. Of this weight, 6,600 lbs was powerful RDX explosive. The bomb was designed to be mounted across the bomb bay of a Lancaster bomber. It was spun using a system of V-shaped pivots to which was attached a small motor built into the bomb bay. Upkeep was not an easy bomb to deliver and the elite of Bomber Command joined a brand new squadron called 617 in March 1943. The crew had to release the bomb while flying at exactly 220 mph and at a height of exactly 60 feet above the water. If the Lancaster was forced into a tight turn at this height, one of its wing tips would barely be above the surface of the water. Precision flying at its best was needed just to get the bomb in motion. To add to the difficulties, the crew had to drop the bomb at exactly 425 yards from the dam wall. There could only be 25 yards either side of this figure – a tiny amount of seconds given the speed theLancaster’s would be flying at – and the fact that German guns would be targeting them. To add to the task, the attack was also scheduled to be carried out at night. 617 Squadron was lead by Wing Commander Guy Gibson and he was allowed to select the men who were to be on the attack. 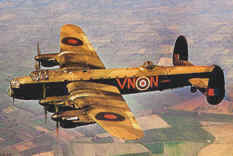 The whole attack was given the code-name ‘Chastise’. 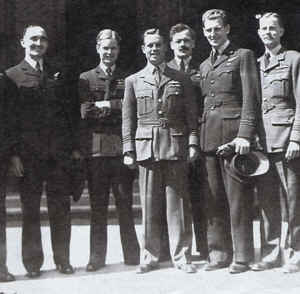 Gibson was ordered by ‘Bomber’ Harris, head ofBomber Command, to pick men who had survived near enough 60 bombing raids as these men would have the necessary experience needed for the attack. 617 squadron started extensive sessions of low flying but none of them knew the target they were practising for – this they were only told at the last minute. On the night of May 16th, 1943, nineteen Lancaster bombers took off from Scampton in Lincolnshire. They had three primary targets: the Möhne, Eder and Sorpe dams and two secondary ones, the Lister and the Eneppe dams. Of the nineteen planes, five would be held in reserve during the attacks. Gibson led the first attack. At 00.56 hours, the Möhne Dam was breached and by 01.54 hours so was the Eder Dam. The Sorpe Dam was attacked by planes from the reserve force but, though hit, it held out. Just how low the Lancasters flew during the attack is shown by the fact that one Lancaster had to turn back as it had hit the sea on the journey to mainland Europe and lost its bomb. The attack had huge propaganda value and made Gibson a national hero. Of the nineteen Lancasters that took part in the attacks with 133 crew, eight planes were lost with the loss of 56 men; three of these men survived to become prisoners-of-war. Gibson was awarded the Victoria Cross for bringing round his Lancaster to give covering fire to the Lancasters that were following up his attack on the Möhne Dam. 33 others members of 617 squadron were also decorated. How successful was the raid? In the short and long term, the damage done by 617 squadron was repaired quite quickly. But the most important impact of the raid was that 20,000 men working on the Atlantic Wall had been moved to the Ruhr to carry out repairs to the damaged and breached dams. This work was completed before the rains of the autumn appeared.